Finalist for the Bookseller’s Best Award!! Winner of All About Romance Best Series Romance Book of 2006!! Since becoming a single father, Mac Edwards has struggled to keep his small family together. But now his custody of his twelve-year-old daughter is threatened by the secrets she’s keeping. In a bitter twist, their new social worker is the one person he can’t trust—Rachel Filmore. Thirteen years ago she was his world…until she deserted him. How can he trust her not to destroy his family? And how can he trust himself to leave the past where it belongs? “In recent years I’ve read a lot more series romance. The main reason is probably just that I have been busier, and a shorter, quick read often appeals to me. 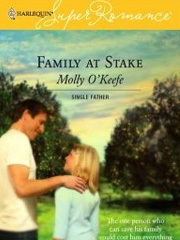 Family at Stake is a meatier book, though, dealing with such weighty matters as abuse, child protective services, and troubled teenagers. Light and fluffy it isn’t, but I enjoyed it very much nonetheless.